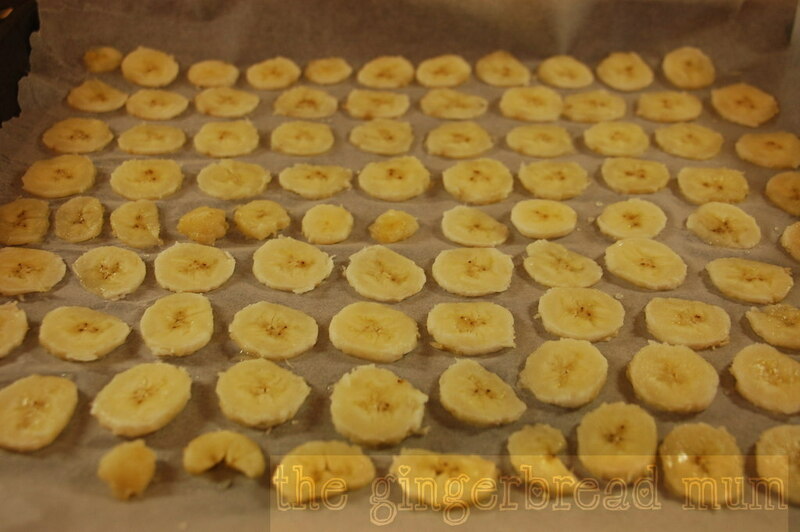 I didn’t realise how much I used bananas in cooking until I started writing this blog! There’s banana muffins, banana teething biscuits, banana chips, banana icecream, banana pikelets, banana and butternut squash loaf, and they’re also my ‘secret’ sweetener in my sugar-free flapjacks. And these are just the recipes I’ve blogged! Banana is commonly one of the first solid foods a baby experiences, and I think I probably just tried different things with them as Nicholas always loves them. I also pretty much constantly have some very ripe ones in the freezer waiting to be turned into something yummy. 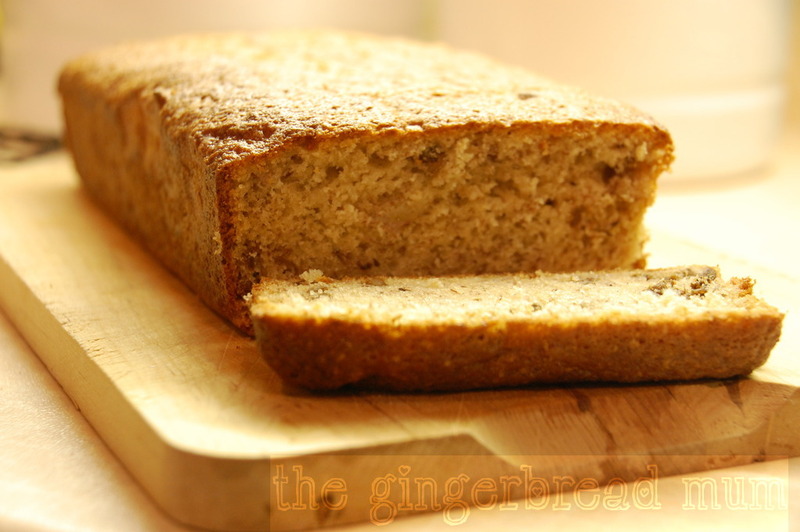 I’ve tried many banana bread recipes over the years with varying degrees of success. Most of the time I prefer mine to be light and fluffy like a sponge, rather than heavy and moist. And while I adore cream cheese frosting, for me this banana bread is much better without it distracting your taste buds. It also means I feel less guilt when eating it for breakfast. 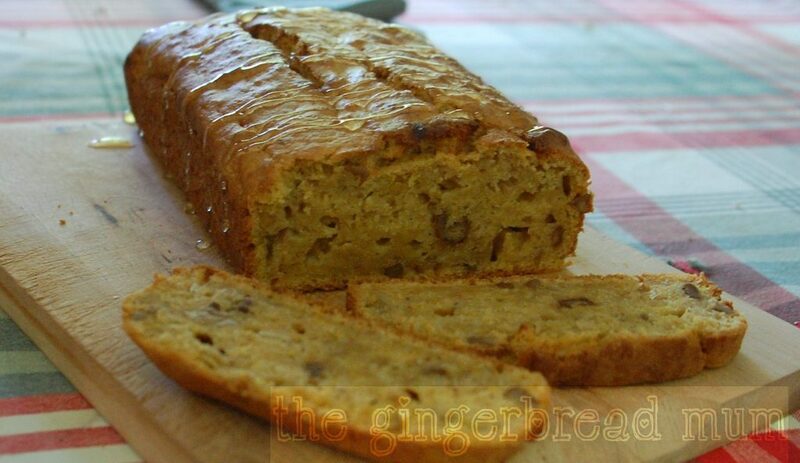 Banana bread recipes are quite similar overall with a different tweak here and there. My recipe isn’t anything new, but it’s evolved from combining recipes I’ve come across and experimenting until I was happy. One thing you might want to experiment with is the texture of the mashed banana. Some cooks puree it with a blender while others leave it quite chunky. Supposedly pureeing it gives a richer banana flavour to the finished product. I mash my bananas with a fork, but mash about half of them until they’re very smooth and the remainder I only mash a little so you find the occasional chunk in the finished bread. There’s quite a bit of banana in this recipe, but you can easily get away with less; even two smallish bananas would work fine (you want at least 175g of it unpeeled). 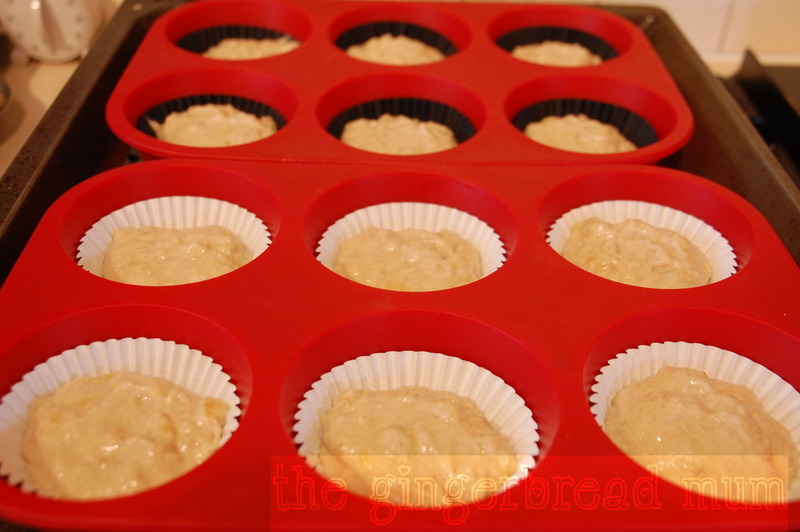 Sift in the flour and baking powder, add the mashed banana, and mix until combined using a low speed. Gently stir through the walnuts. I’m linking up this recipe to the One Ingredient Challenge hosted by Franglais Kitchen and How to Cook Good Food. 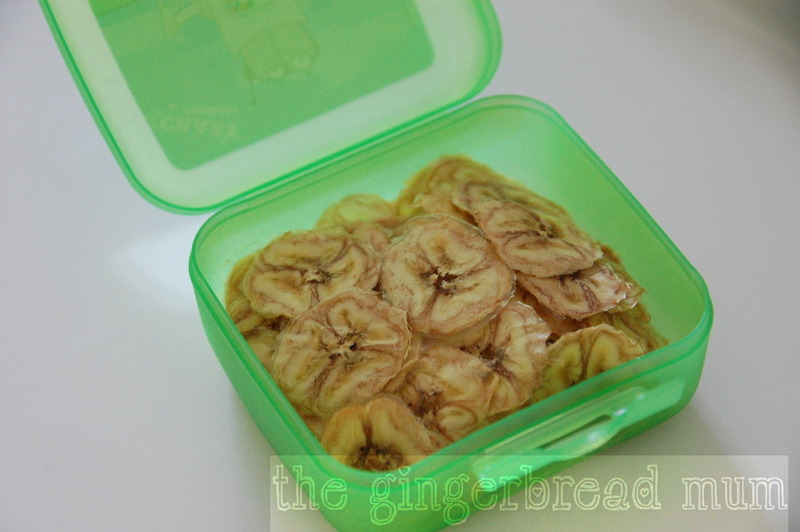 Why not enter your own banana recipe and join the linky party? Read the rules here. 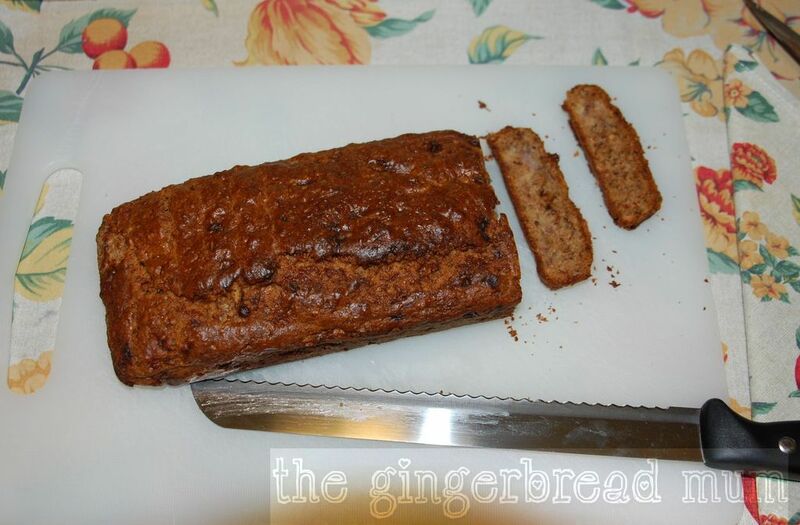 Posted in cooking with toddlers, dessert, family, recipe, snack, toddler and tagged banana, banana bread, banana cake, breakfast, dairy-free, dessert, family, finger food, Franglais Kitchen, freezable, How to Cook Good Food, One Ingredient Challenge, recipe, snack, toddler. Bookmark the permalink. One of the last things I did before running out the door before our holidays (amazingly the first time I wasn’t running like a lunatic due to being so late) was to throw the remaining (very ripe) bananas in the freezer. It gave me a (silly) sense of pride to know we weren’t wasting them. It’s the little things after all! While we were away I came across an unusual recipe for banana bread from Simon Rimmer with the added ingredient of butternut squash. 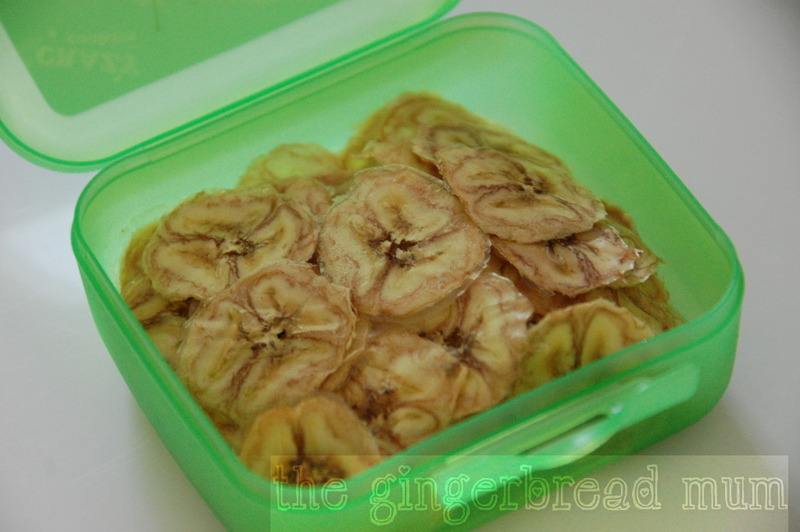 I’m always looking for different ways to use up bananas and this recipe definitely piqued my interest. 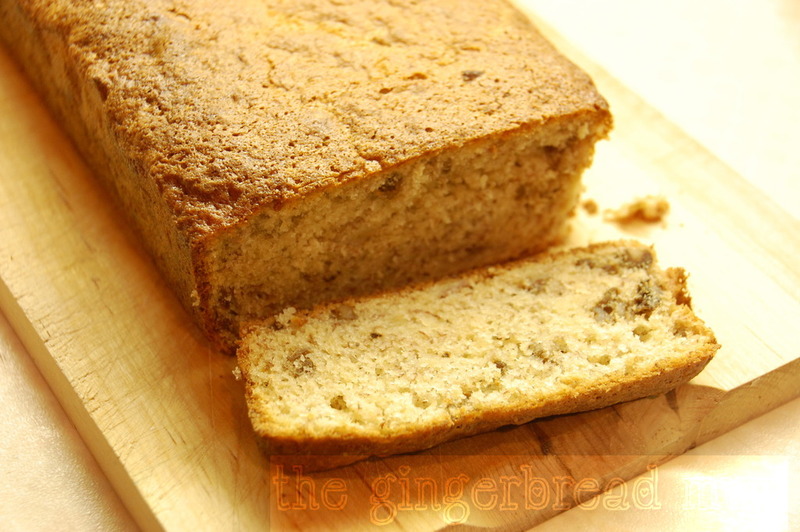 The end result is a lovely dense and very moist cake with a subtle taste of banana. If anyone guessed this cake has a vegetable ingredient, I’m certain they’d never guess butternut squash. Another way to sneak some veg into your children’s diets perhaps? And if you have any pureed butternut squash in the freezer leftover from your munchkin’s earlier weaning days, I can’t think of a better way to use it. In a medium-sized bowl, whisk together the sugar, egg and vegetable oil. Fold in the mashed banana and butternut squash. In a separate bowl, sift the flour, baking powder and cinnamon. Fold this dry flour mixture into the wet banana mixture. Stir through the walnuts. Pour into the prepared loaf tin and bake for 50-60 minutes until golden brown on top and a skewer inserted into the middle comes out clean. Leave to cool. 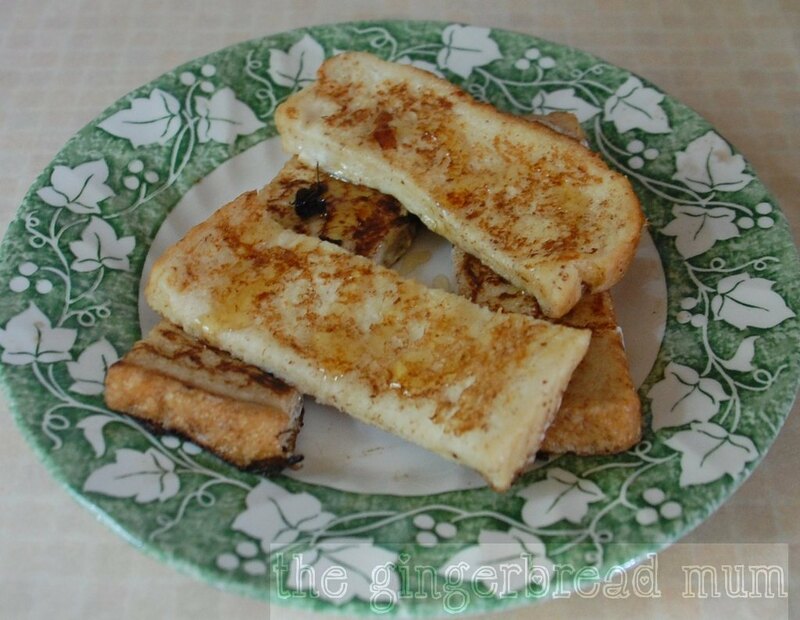 Drizzle honey over the top of the loaf before serving. Tip: If you have the time, it’s much better to peel your bananas before freezing them, as peeling a frozen or defrosted banana takes some skill. Just peel, throw in a ziploc bag and freeze. 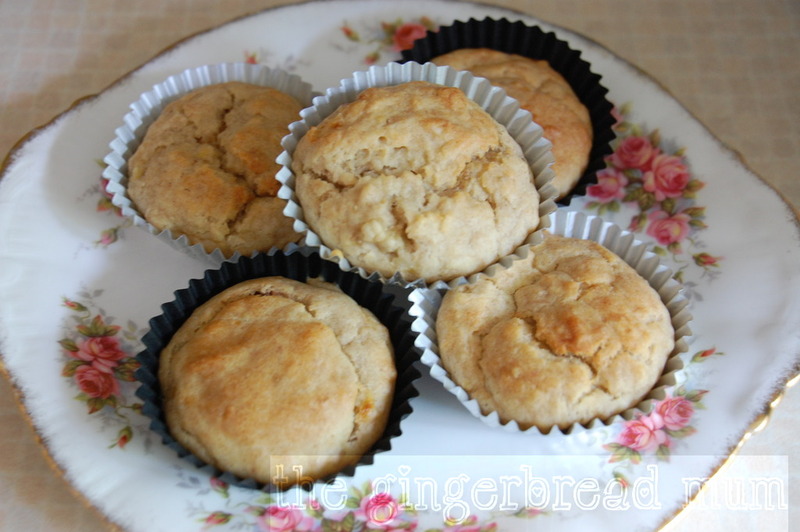 Posted in dessert, family, recipe, snack, toddler and tagged banana, breakfast, butternut squash puree, dairy-free, dessert, family, finger food, freezable, recipe, Simon Rimmer, snack, toddler, vegetarian. Bookmark the permalink. Biscuits are my favourite thing to bake. They’re probably my favourite thing to eat as well. For a quick sugar fix with less guilt than a piece of cake, they can’t be beaten. I like them chewy, crumbly, crisp or gooey – I’m not picky! Usually the perfect accompaniment is a glass of milk, but for the famous Italian cantuccini that are rock hard you have to, just have to, dip them in a sweet dessert wine. Cantuccini are extra hard from being baked twice. 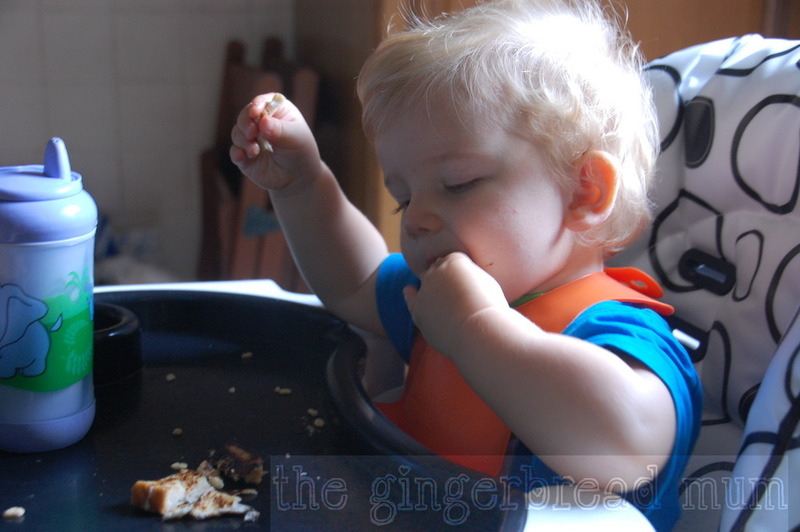 This technique is perfect to make teething rusks or biscuits for your dribbling munchkin to gnaw on. 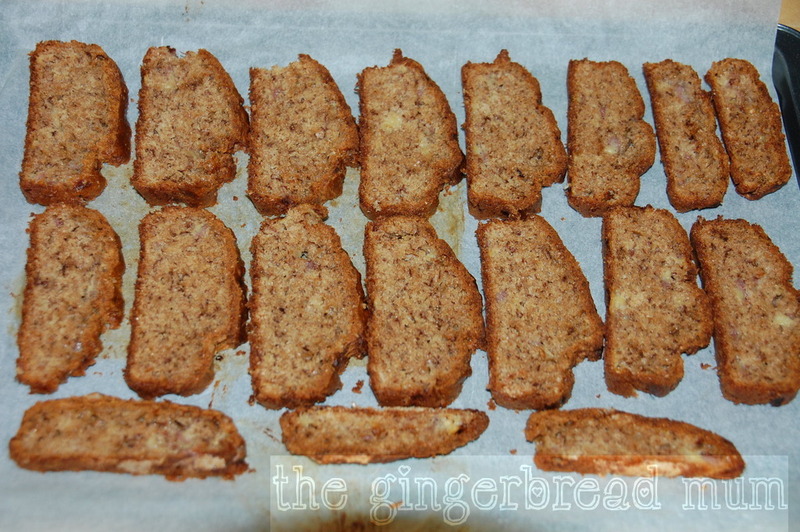 I came across a recipe for twice-baked banana teething biscuits by Jennifer Cheung. This is my first try and it needs some adjusting. The second baking was too long in my oven and it coincided with Nicholas needing more attention so I didn’t check them. Although in the photo of the original recipe the biscuits look very dark, mine came out looking more burnt :(. Oh well, not everything works all the time. Next time I would bake them the second time for 20-30 minutes. However, Nicholas hasn’t minded them being overcooked. I made half the mixture. First because the recipe looked as if it would make a large amount of biscuits (although you can freeze the biscuits) and second because I had one and a half very ripe bananas that needed using and they mashed up into exactly half of what the original recipe needed. I used a loaf pan rather than the slice tin suggested because of the smaller amount of mixture, but it rose a lot so next time I’d use a wider tin. Pour into prepared tin and bake for one hour. Leave the oven door open to cool and drop the temperature to 150C. Remove what now looks like a banana cake from the pan and cool a little. 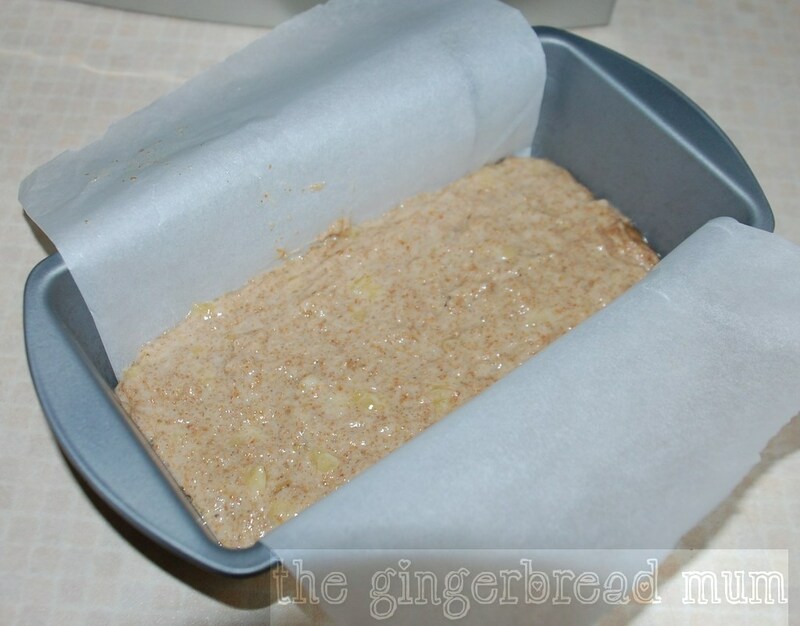 Slice into sticks (I found it easier to use a bread knife as my loaf was quite high) and lay the slices on a baking tray lined with baking paper. What do you do when your little one is teething to help soothe their sore gums? Update: my next attempt at these biscuits was much more successful… and also sugar-free! 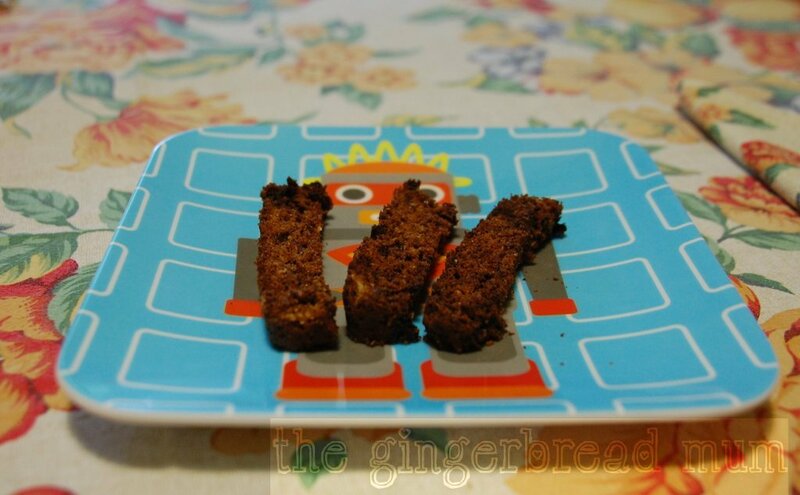 Posted in baby, recipe, snack, toddler and tagged baby, banana, biscuit, cantuccini, finger food, freezable, freeze, Jennifer Cheung, recipe, snack, teething, teething biscuit, teething biscuits, toddler, wholemeal flour. Bookmark the permalink.